Four German soldiers wearing fur coats and gas masks in a trench, 1917. This 1917 field portrait depicts four soldiers wearing heavy fleece coats, steel helmets and late model gas masks. The bitter 1917 winter was the coldest in living memory for soldiers on both sides of the front. Soldiers suffered from frostbite and exposure, causing them to lose fingers. The muddy walls of trenches became hard as bricks, and any food and water became almost impossible to eat. The standard cold-weather protection issued to soldiers was the so called trench coat. Constructed from wool serge, they were a considerable weight, even when dry. Difficult to wear with equipment, and prone to fouling with mud and water – creating an even weightier piece of clothing – they were bulky and long. 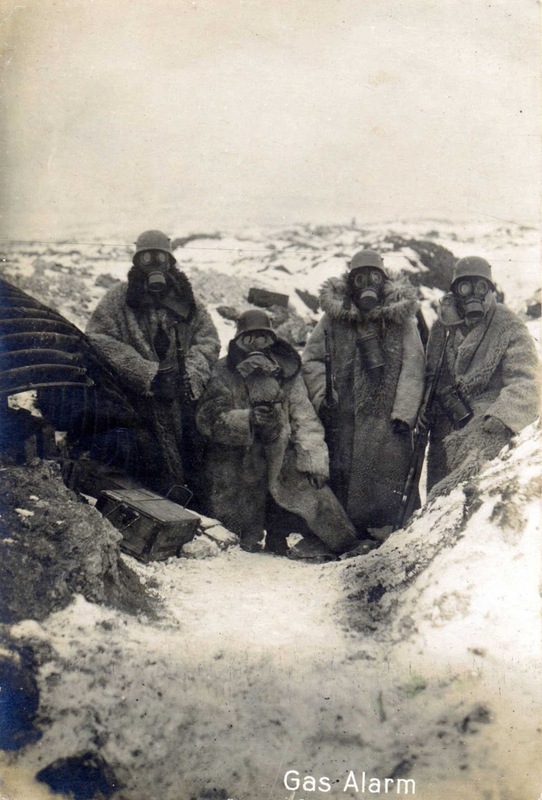 The German troops shown in the picture are using the new Lederschutzmasken, a leather gas mask made of specially treated Bavarian sheepskin with removable lenses. Designed to replace the rubberized cloth gas masks, the 1917 respirators proved to be far more effective against phosgene gas than the 1915 masks. The mask covered the soldier’s eyes and mouth to limit injury by chemical gas, but the rest of the head remained uncovered. The Allied powers dismissed the new design as evidence that material shortages on the German home front were forcing changes. The soldier second from the left has an earlier Gummimaske and not the Lederschutzemaske. The puffiness around the eye lenses and, to a lesser extent, the lenses themselves give it away as being the Gummimaske.